It's nothing special, but it's still pretty tasty. A nice side dish on family taco night. Growing up, our family taco nights included something we knew as Old El Paso Mexican Fried Rice. It came in a yellow box, it was vaguely exotic to my young Winnipeg taste buds, and we loved it. 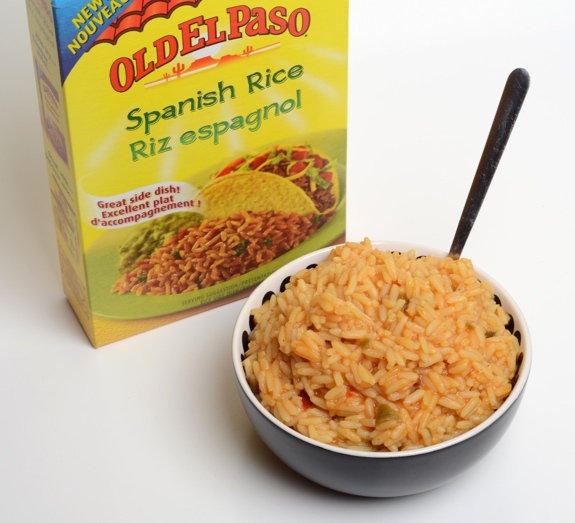 And then it vanished from Canada, though it continued to exist in the U.S.
And so, on trips to the States, we’d stock up on boxes of the stuff, now under the name Old El Paso Spanish Rice. We’d ration it, saving it for special occasions, every mouthful a reminder of the relative inadequacy of Canadian grocery selection. And then it returned. Suddenly, about a year ago, there it was at my local Edmonton grocery store, with a “NEW!” label printed on the box. 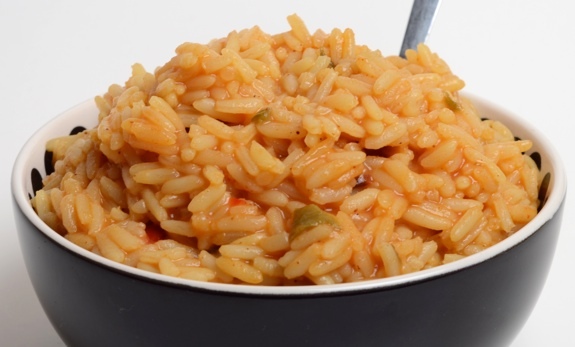 The “NEW!” Spanish Rice tastes much like the old Mexican Fried Rice, and is not to be confused with Old El Paso’s Mexican Rice, a related cheesy rice dish that is also now available in Canada. It’s hard to isolate individual flavours, but it’s mostly just rice cooked with a whole lot of salt and typical taco-seasoning-mix-pouch spices. Tomato and onion are present, as are little flecks of dehydrated (then rehydrated) red and green peppers. The texture of the rice is somewhat firm, which I think suits it fine. You could make it more or less firm/mushy/sloppy by tinkering with the cooking time and water ratios. It’s not outstanding, but it pairs nicely with a plate full of tacos. Old El Paso Spanish Rice sort of tastes like salty taco seasoning mix, but, you know ... in a good way. Cost: $2.99 per 215 gram box. Value for cash money: Not bad. As a side dish, you could serve a couple of (not very hungry) adults and a couple of (not very hungry) kids. Nutrition? : 210 calories per serving, of which there are four in the box. Realistically, I can eat half a box along with a few tacos. Loads of sodium (670 mg per serving), some calcium, some iron. The verdict: I’m not sure why I love it so much. It’s not the best rice side dish in the world, but it’s easy to make and it reminds me of taco nights as a kid.